So it is very much advantage Sebastian Vettel as the German aims to extend his championship lead over Lewis Hamilton. Vettel is in the perfect place to do so as he is on pole for the German Grand Prix, while Hamilton will start a long way back in 14th because of a hydraulic problem. Thank you for joining us and for all your comments today. We will be up and running with our live page at 12:30 BST tomorrow and hopefully you can join us. See you then. Will Sebastian Vettel taste home victory on Hockenheim's return? Lewis Hamilton will start the German Grand Prix from 14th on the grid while title rival Sebastian Vettel took a stunning pole position for Ferrari. Hamilton's Mercedes suffered hydraulic failure in the first part of the session, grinding to a halt on track. Vettel set pole from Hamilton's team-mate Valtteri Bottas by 0.204 seconds and is now in position to extend his eight-point lead in the championship. But Bottas' second place gives him a chance to challenge Ferrari. The Finn edged out Vettel's team-mate Kimi Raikkonen by 0.131secs and has the inside line on the run to the first corner for Sunday's race. Bottas said: "The start is going to be crucial. Race pace-wise, it is going to be close." Sauber's Charles Leclerc starts ninth and tells Sky Sports: "Our quali pace is good so hopefully we can have similar pace to what we had in Silverstone." Max Verstappen starts fourth and he tells Sky Sports: "You have to be realistic when you are lacking so much horsepower it is not going to solve itself. The car is quick, we are starting fourth so a lot is possible. Hopefully we can be closer than we were in qualifying." Romain Grosjean, who qualified sixth, tells Sky Sports: "Pretty good, a good session and on a track when we weren't sure we would do well, it is all encouraging. Let's try to avoid contact between team mates and we should be alright." RantingMrP‏: Great lap for pole Vettel! Bottas absolutely wrung all he could from the car for P2. Shame Lewis wasn't in Q3, because he usually has a couple of tenths on Bottas and would undoubtedly have given the Prancing Horse a run for its money. The race will be fantastic! Capo Di Tutti Capi‏: Boooooooooooom, Kimi never just puts it together when it matters! We could have locked out the front row. Joseph Joe Jay Jnr‍: What a lap by Sebastian Vettel, last time I saw a lap that good was Lewis Hamilton at the 2018 Australian GP. Kimi Raikkonen, who starts third tomorrow, says: "I had a small moment in the first run at 12, and went sideways, in the second run I had a bit of caution because of that. "There was more but it didn't come. We will try to race ourselves, we are going to race for the team and third place is a pretty good place to start." Valtteri Bottas starts second on the grid tomorrow: "I think it was a good lap, I gave it my all but unfortunately they were too quick today..."
Lewis Hamilton spoke to 5 live's Jennie Gow a short time ago. "It definitely was a tough one but these things happen and all you can do is try and gather your thoughts and live to fight another day, another opportunity to rise, so I'll give everything tomorrow to see how high I can get up but it's not going to be like Silverstone," he says. Asked where he hopes to finish tomorrow, he said: "I'm sure I'll be able to get through to some point, but to where I don't know." And asked if the hydraulic failure was caused by his airborne moment in turn one, he replied that it "failed before then". Polesitter Sebastian Vettel says: "Thanks to the fans, it was amazing to see so many Ferrari and German flags. It just kept getting better and I knew for the last lap I had a little bit more in more, I'm full of adrenaline but so happy." The home fans are loving it. Ferrari and German flags are being waved and Sebastian Vettel held off Valtteri Bottas with a new track record of 1:11.212, compared to Bottas' 1:11.416. Raikkonen third, Verstappen fourth, Magnussen fifth, Grosjean sixth, Hulkenberg seventh, Sainz eighth, Leclerc ninth, Perez 10th. Ferrari, Mercedes, Ferrari, Red Bull, Haas, Haas are the top six. A worried looking Toto Wolff. Will his mood get even worse with an all-Ferrari front row? 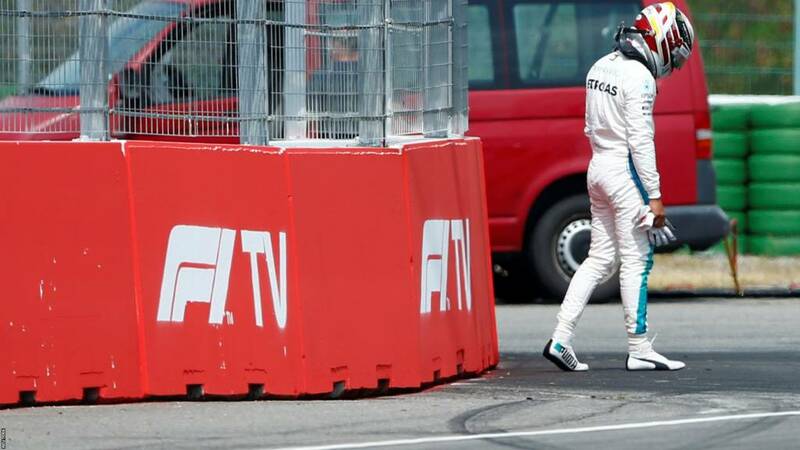 Three minutes for Valtteri Bottas to save what has been a tough day for Mercedes.